You no longer have to wait for your bet to reach its natural conclusion, with this Cash Out option you have the opportunity to track your selections and Cash Out at a point of your choice. Depending on the bet/potential outcome, you will either make an early profit on a winning bet or a reduced loss on your initial stake for a losing bet. The potential returns and remaining stake are displayed on the Cash Out button, where you can choose how much of your bet to Cash Out and click to confirm your choice. The partial cash-out mechanism is presented using a sliding scale showing cash-out values on the portion of the bet the customer wishes to trade. This feature is called ‘Close Bet’ and is now available for bets placed on Football, Horse Racing, Cricket, Tennis and Basketball via mobile, tablet, iPhone, iPad, bet365’s premium mobile site and the normal desktop version of the website. The Cash Out feature is currently only available for selected single bets and straight accumulator bets. Bet365 are always looking to be innovative over their rivals, and this feature reinforces that stance. They are the first bookmaker to offer such a feature, although PaddyPower and Betfair a couple of months ago declared they were developing a similar option following the success of their regular cash-out feature. 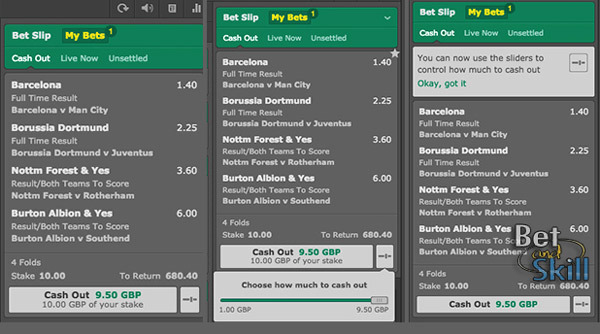 "Bet365 cash out: how to use the partial Close Bet feature"